Get Your 2 Year Old to Nap! Even the best of sleepers often begin protesting nap time around this age. Here are my tips for preserving nap time a bit longer! Cuz heaven knows our sanity depends on it! *Don't underestimate the power of physical activity. Getting outside in the late morning for rigorous activity is really important! Or do something active indoors if weather is not permitting. *Have a great routine. In our house we do lunch at noon and then get cleaned up from lunch, change diaper, get a drink, sing our song, kisses, and light's out. *Light's out means that the room should be 100% dark! Don't underestimate this either! Get black out coverings or good blinds with good black out curtains on top. I can't stress it enough. *Avoid screens. I know lots of families that like to turn on a show in the morning but just don't let it stay on all day. Get it shut off a couple hours before nap time. *Don't give up! Consistently put your child down for that nap and even if they don't fall asleep then they've at least had an hour of "rest time" in the afternoon. If they refuse the nap, you can always move bedtime an hour earlier. There is a good chance your toddler will begin napping again soon if you keep offering it. Naps are typically dropped between ages 3-5 yrs but there are some exceptions. If your toddler still depends on a sleep prop or crutch to fall asleep such as a pacifier or a bottle or your presence then this may be your issue and that's a whole other matter! Contact me if you want to chat about your kiddo learning some independent sleep skills! Daylight Saving Time for Spring Forward is coming up Sunday March 10th, 2019! Young children are much more structured with going to bed and waking at the same time each day so that's why we notice the effects of DST the most in children. So here is my best advice for having a smoother transition! How does that work? First off, don't worry about changing your clocks on Saturday night. Just get up on Sunday morning like normal and then go around the house changing the clocks. It will FEEL better for everyone this way! If you have a child that does not nap and normally goes to bed at 7:00pm, you would put him to bed at 7:30pm on Sunday night, the first night of the time change. Do this for 3 nights, putting him to bed 30 minutes later than normal, then on the 4th night put him to bed at the normal time, 7:00pm or whatever is normal bedtime for your child. Same goes for naps if your child is napping- shift your whole schedule 30 mins later for 3 days and on the 4th night do normal bedtime and on the 5th day do normal nap times. Infants-If you have a baby that has a predictable bedtime then move bedtime 15 minutes earlier each night until you reach the normal time. So if normal bedtime is 7pm, then the first night you would put him down at 7:45pm, the second night 7:30pm, and so on. In four nights you should be back to 7:00pm. If your baby does not have a predictable bedtime yet then don't worry about it and just get them on the new time as soon as possible. Your child will take a bit longer to fall asleep at first as it will feel earlier for them but in about a week they should be adjusted to the new time and falling asleep normally. Make sure your child's windows are totally blacked out so they can fall asleep easier and sleep to normal time even though more sun will be coming in the windows! Good Luck! 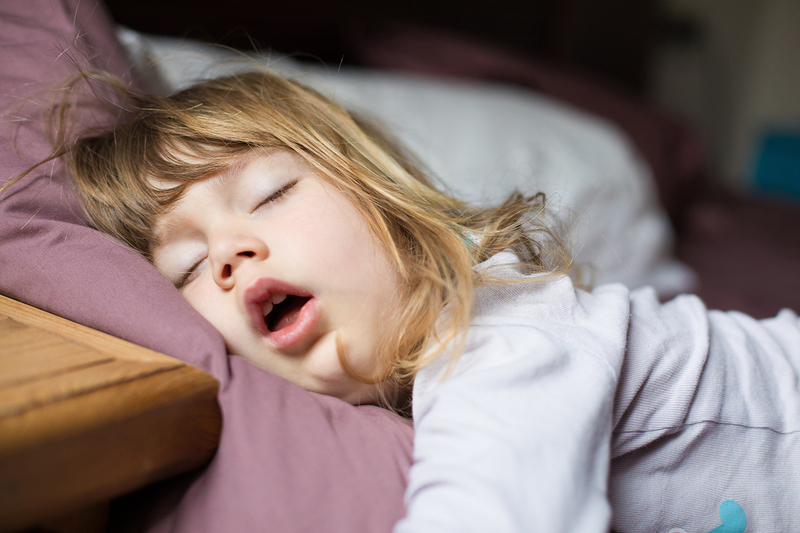 Does your child frequently snore or mouth-breathe? I don’t want to cause any paranoia here but if this is your child, it may be cause for concern so please read on. If there is a physical reason for your child’s sleep difficulties then I’d much rather you get that checked out first before we work on any behavioral sleep issues. Now, anyone who has ever dabbled in yoga or trained for an athletic challenge of any kind will tell you that proper breathing has incredible benefits, and that proper breathing, by definition, is done through the nose. There are a few reasons why nose-breathing is better for you than mouth-breathing, and they’re not minor benefits. Breathing through your nose increases the amount of oxygen we get to our lungs, expels more carbon dioxide, lowers our heart rate, increases lymphatic flow, and reduces stress on the heart. Mouth breathing, on the other hand, has some pretty nasty downsides. Long-term, chronic mouth breathing in children can actually affect their facial growth, mess with their teeth, cause gum disease, throat infections, stunted growth, and a little closer to my heart, lack of quality sleep. As you probably already know, we all sleep in cycles. We go from a very light sleep into deeper sleep, then deeper still, and then into the dreaming stage known commonly as REM sleep. During that first stage of light sleep, as well as in the REM stage, we’re very easily woken up. And what causes baby to wake up in those light stages of sleep? Often times, noise. Barking dog, garbage truck, washing machine getting thrown off balance during the spin cycle, and sometimes, the sound of their own snoring. That’s not the only reason for waking up, mind you. If their airway is obstructed to the point where they temporarily stop breathing, what’s known as an obstructive apnea, the body tends to startle itself out of sleep. (And I’m sure we’re all happy for that little fail-safe, even if it does lead to nighttime wake ups.) Now, I could rehash all the things I’ve said before in my blog posts about the benefits of solid, consolidated sleep, as well as the detriments of sleep deprivation, but I’ll leave it to the National Institutes of Health and their extensive study on the subject if you want a refresher. Suffice it to say, your baby needs a lot of sleep, and it’s bad for them in a whole lot of ways if they don’t get it. So if your baby is snoring, you should absolutely take action. The first thing you should do is grab your phone and make a recording of your little one breathing while they sleep. The second step is to take that recording to your pediatrician and play it for them. Just going to the doctor and telling them your baby’s snoring might not spark a lot of concern on their part, but being able to demonstrate the severity of the issue can light a little fire under them and prompt them to refer you to a respiratory specialist. Removal of the tonsils and/or adenoids is often the next logical step if their airways are significantly blocked. If your little one’s snoring isn’t severe enough to warrant surgery, however, the doctor will probably have some suggestions that are less invasive. Just a final note to add here. If your baby is sick or congested, don’t jump to the conclusion that their snoring is permanent. A little nasal congestion due to illness can cause baby to snore, but it should clear up when they get better. No breathing issues or they aren't severe and your child isn't sleeping? Set up a call with me so we can get your family sleeping through the night! One of the most interesting aspects of my job is that I get to work so closely with such a wide variety of people and personalities. Coming into people’s lives, especially at a time when they’re vulnerable and emotional, has allowed me to get to know a lot of different families. One thing that seems to remain somewhat constant though, is that there’s usually one parent who I would define as the primary caregiver when it comes to sleep and one that is secondary. I’ve seen all kinds of family dynamics and divisions of labor but let’s not kid each other, sleep training is a tough gig that no parent is excited to tackle alone. You’re obviously sleep deprived by the time you decide you need to take action, and you have a few nights ahead of you that are probably going to test your patience and determination, and if only one person is involved, it’s going to be that much more of a challenge. So, I write this post to you today, dear secondary caregiver. If you’re feeling left out of the child-rearing process and wishing you had more of an opportunity to bond with your baby and take some of the parenting stress off of your partner’s shoulders, this is your moment! And let me tell you something... nothing is going to solidify your place in your partner’s heart quite like taking a leading role in getting your child sleeping through the night. I am not even slightly exaggerating here. If you’re reading this, I would guess there’s a decent chance you’re already feeling the effects of at least a few nights of sleep deprivation, so you don’t need to be told how serious the effects really are. The thought of months or even years of this seems like an impossible situation, and your partner undoubtedly feels the same way. So let me tell you,there is just nothing sexier than waking up exhausted in the middle of the night and seeing your partner already getting out of bed, telling you to lie down and go back to sleep, with those three magic words... “I got this.” 😉 Is it easy? No, not particularly. Sleep training can be challenging. There’s likely to be some crying, some moments of doubt, and a few trying nights, but everyone I’ve guided through the process would do it all over again in a heartbeat now that they’ve got their child sleeping through the night. So now that you’re ready to take the reins on this, I’d like to speak to the primary caregiver again. So check this out, you lucky duck.Your partner is awesome! They totally recognize your efforts in raising your child and want to pull a little extra weight. They want to take an active role in helping you get your baby sleeping through the night. So congratulations on your excellent choice in a partner. So what’s the catch? Well, you have one very simple but difficult task here. You have to let them do it. As the chair of the parenting department, that might be difficult. You’re probably used to having the veto power when it comes to baby-centered decisions, but I want you to relinquish that for a while. Sleep training requires consistency, and you and your partner should have a well-established plan that you’re both comfortable with. So resist the urge to hover over your partner. It’s vital that they know you’re confident in their parenting abilities. Micromanaging someone else’s parenting is likely to result in them just throwing their hands up and saying,“Fine, you do it.” Then you’re on your own again and your partner probably ends up harboring a hint of resentment. Also, and don’t take this the wrong way, but I find that when it comes to sleep training, it’s way more common that the secondary care giver has more success calming baby at night than the primary one. Yep, you read that right. I have a few theories on why this is so often the case, but for now, just know that your chances of success are drastically improved if you let your partner respond to baby during the night. Don’t undervalue what you’ve got here. This is someone with a deep and genuine love for your child who’s available and eager to help you with one of the most daunting challenges of early parenting, and they’re willing to do it for nothing! So be cool. Let your partner do their thing. You might be very pleasantly surprised at the results they get! So now bring your partner back into the room, would you? I want to talk to both of you together here. Listen, what you’re about to do is really going to do amazing things for your little family unit. You’re going to get your baby sleeping through the night, which means you’ll both be sleeping through the night again, but you’re also committing to doing it together, and that’s going to make this endeavor even sweeter. You’re going to learn how supportive you can both be in some tough moments, how much stronger the two of you make each other, and how unstoppable you are when you parent as a team.You’re tackling a problem together, and I think you should both be very proud of that. I hope it goes smoothly but just remember if it doesn’t, I’m always here to help. Two parents presenting a united front is a mighty force, but those same parents armed with an expert to help them through this process, well that’s practically unstoppable. I know this might not seem like especially earth-shattering news, but it speaks to a broader point. So let’s imagine that you and your partner are the proud parents of a new baby which means you have to make a zillion decisions about parenting and come to agreements with your partner. What time should we put him to bed? What do we do when he starts crying? Who is handling night wakings? Are we going to breastfeed? Are we able to? How will we discipline? Those are all questions that need to be agreed upon and then reevaluated if things aren’t going smoothly. So here you are, faced with all of these decisions, you’re frustrated because things aren’t going smoothly to begin with, and to top it all off, your ability to recognize and respond to each other in a rational, civilized manner has been seriously compromised. Two people forced to debate the most important decisions they’re likely to make in their lives, and you are doing it while sleep deprived. On top of that, couples who don’t get enough sleep are less likely to show gratitude towards each other, and significantly more likely to feel unappreciated, according to Amie Gordon, a doctorate candidate in social-personality psychology at UC Berkeley. And as though that’s not enough, consider the fact that lack of sleep decreases libido. Yikes. Now, loads of couples get through this period in their lives with their partnership intact, and I’m not trying to suggest that sleep deprivation is going to be the end of your relationship but it certainly doesn’t help. Babies are amazing though, right? What can possibly compare with those first few months when you and your partner stand over the crib together and look down on that precious new life that the two of you created together? The closeness you feel to your partner at that time is unmatched, and it’s a period in your life that deserves to be cherished. That’s not so easy to do if you and your partner are constantly fighting because neither of you are getting enough sleep. There are so many reasons to make your little one’s sleep a priority when it comes to their well-being, but I’d ask you to take a selfish little detour for a moment and consider what it can mean for you, your partner, and your relationship. After all, if there’s one gift your kids always appreciate, it’s seeing their parents happy, united, and in love. Commit to getting your little one sleeping through the night and see how you feel once you’re all getting the rest you need. The results, I promise you, are nothing short of amazing. DO YOU HAVE A crib CLIMBER? I remember the night our daughter climbed out of her crib for the first time. She was just barely 2 years old and she showed up in our bed in the middle of the night that night. I about had a heart attack! Our girl is a pretty skilled climber so I wasn't terribly worried about her injuring herself, but the chance is always there. Not knowing any better, we thought our only option was to switch to a toddler bed straight away. Aaaaddd....surprise! It didn't go well. If this is a familiar situation to you, here are some tips before making that switch to a big kid bed! My recommendation is to wait until as close to age 3 as possible to make the switch. Most children under this age are just not capable of handling the freedom. difference that your child can no longer climb out. 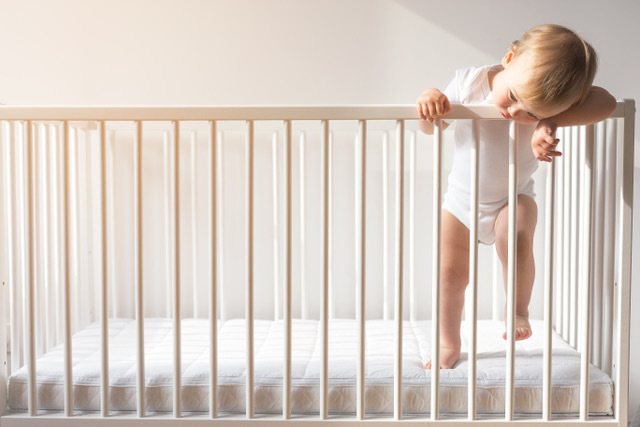 it too difficult for your child to climb up and swing their legs over the crib! When you do make the switch, I recommend going straight to a twin or full-sized bed. Then be very clear about the rules! 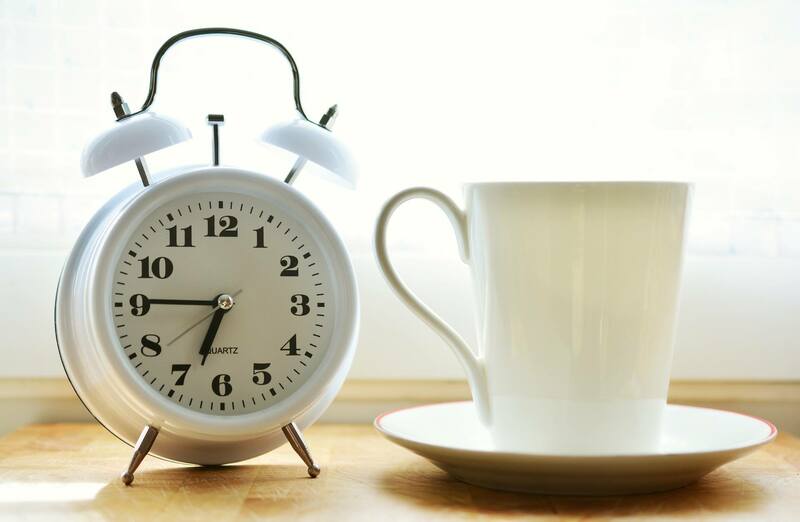 An okay-to-wake alarm clock and reward systems are helpful. But the key is to enforce your rule of staying in bed. Good Luck! HOW DO I KNOW IF MY BABy's NIGHT WAKINGS ARE DUE TO HUNGER?! 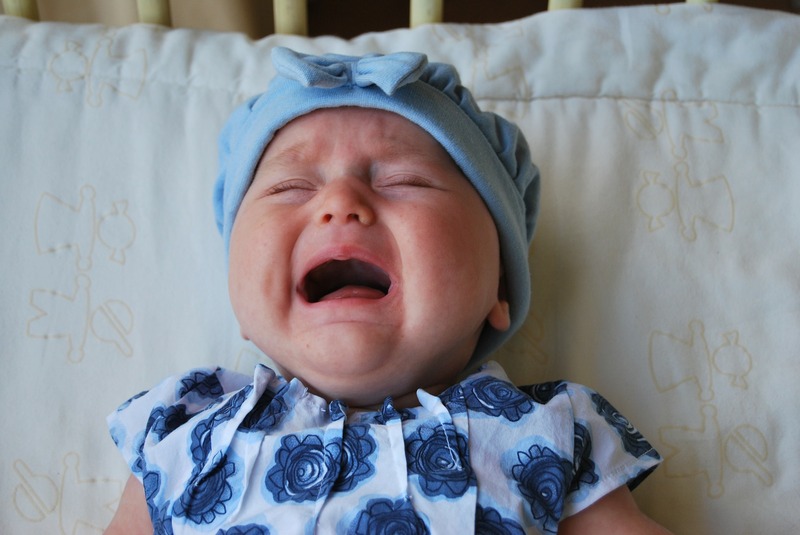 Babies cry for lots of reasons...this is their only way of communication after all! But how do you know if your baby is actually hungry each time they are waking in the night?? This can be one of parent's biggest struggles. Most of us, myself included, are consumed by making sure our children are getting enough calories and nutrition each day. Both of my own children were tiny babies and have always been on the low end of the growth chart so I'm especially sensitive to this whole idea. Dropping that last night feeding was extremely difficult and worrisome for me so I completely understand the struggle. Here are a few things for you to consider if your baby is waking in the night. Are they over 6 months of age? 6 months is a good benchmark and typically the age where a baby can sleep through the night. Of course you should talk with your pediatrician first and make sure your baby's growth is on track but chances are if your baby has reached this mark and is still waking, then their night feedings are probably more so habitual rather than actual hunger or caloric need. 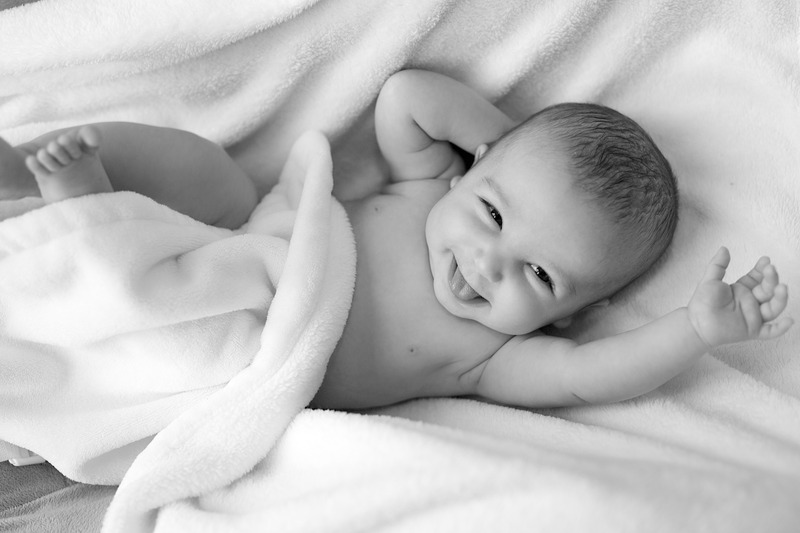 Some infants sleep through the night much sooner, so if that's your baby, don't be worried! Thank your lucky stars!! Are they eating enough during the day? Is your baby getting good solids and taking full feedings during the day? If not, you may be in a vicious cycle of more calories in the night than in the day and will need to make a switch. Babies will very quickly make up lost calories from the night the following day. But if they are getting adequate daytime calories then you can be more confident that they don't need the extra calories at night. Is baby falling asleep quickly when you feed them? The scenario looks like this- your baby just went to sleep an hour ago but is up again crying, you offer a feeding and they take an ounce before they pass out again. There is a good chance they are only feeding for comfort/assistance falling asleep rather than hunger. Let's say your baby does take a full feeding. Do they go back to sleep for a good long 3-4 hour stretch afterwards? If not then again the wakings are more likely due to comfort and sucking than hunger. Some babies just have a very strong feed/sleep association and so this needs to be broken in order for your child to sleep through the night. We call this a prop or crutch. If your child falls asleep at bedtime nursing or taking a bottle, then they will ineveitably have wakings in the night where they need the breast or bottle again. That's because this is the only way they know how to fall asleep! When they learn to fall asleep without their prop, then they will be able to get themselves back to sleep in the night without it. Babies who know how to fall asleep independently sleep through the night much earlier than other babies. I hope this helps you to distinguish what's going on with your little one! I know that dropping feedings can be a tough process so I'm here if you need me! Oh those dreaded early morning wakings!!! I'm not a coffee drinker but man when I get hit with a streak of early wakings from my little guy, I wish I was! There can be many reasons for early wakings but first off, if your child normally sleeps until a decent hour and the wakings start out of the blue, it may just be a phase that will last a week or 2. So, don't panic! You may just have to ride it out. However, here are some things to consider and tips to try especially if it has been going on for a long time! -Make sure your child's room is DARK! It should be as dark at 6:00AM as it is at 4:00AM. During summertime, it gets light outside earlier, and even the slightest bit of light coming in can wake a child. Invest in some good black out shades or blinds. You may even have to double up with blinds and then black out shades on top. -Try to keep your baby in the dark room until your minimum wake up time. Ex. 6:00AM. If you consistently get them up for the day and out into the light it can make your babies body clock and melatonin levels set to waking at the too early time. -With an older baby, create a buffer before you offer the first feeding. If you get your baby out of the crib at 6:00AM, wait 5-10 minutes before you offer the first feeding. This creates just enough space that they won't be waking in anticipation of the feeding. -Make sure your baby isn't cold. The body temperature drops around 4:00AM. Use socks or sleep sacks and warm jammies to keep your baby comfortable all night. -If your baby eats solids, make sure they are getting solids with plenty of good fats and proteins throughout the day. -Tinker with the bedtime. More often than not, the bedtime is too late so try a half hour earlier for a week or so. I know this sounds backwards but it may be that your baby is overtired. If this doesn't work then try a half hour later than the original bedtime. 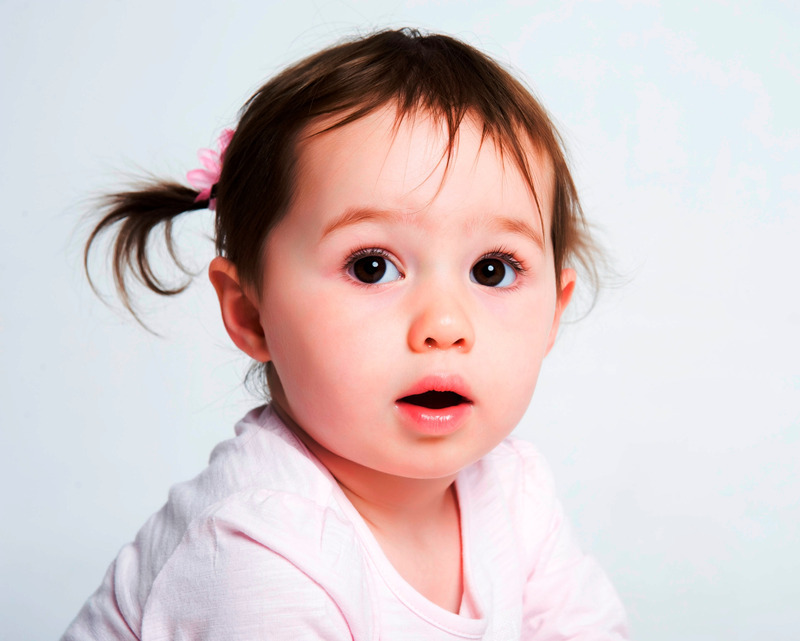 -Make sure your child is getting the right amount of daytime sleep at the right times for their age. Too much or too little daytime sleep can cause issues with morning wake time. I hope your child's early wakings are short-lived and that these tips are helpful! Hang in there, moms and dads. I'm sending strength your way! Your baby wakes up in the morning. You feed her, change her, play with her for a while, maybe feed her again and then rock her to sleep and put her gingerly into her crib for her morning nap. And then, 30 minutes later, she wakes up fussy and irritable and, despite your pleading, refuses to go back to sleep. So after half an hour of trying to put her back down, you finally give in, hoping she’ll be that much more tired when her afternoon nap rolls around, only to have the exact same scenario play out again, and baby is cranky the rest of the day! So here’s what’s going on, and how to fix it. Babies, just like the rest of us, sleep in cycles. We start off in a light state where we’re easily woken up, then gradually fall into a deeper stage where even loud noises or movement might not be able to rouse us. This is the good stuff. This is the really restorative, restful sleep where our brains and bodies do all of the maintenance work that leaves us feeling refreshed. Once we’ve come to the end of the deep-sleep cycle, we slowly start coming back to the light stage again, and typically we wake up for a few seconds and then drift off again, and the whole thing starts again. In adults, one of those cycles typically takes about an hour and a half. In babies, it can be as little as 30 minutes. So the fact that your baby is waking up after only 30 minutes is actually completely natural. “But,” you’re thinking, “I have friends whose babies nap for two or three hours at a time.” Well, that’s partially true. But in a more literal sense, they’re stringing together several sleep cycles in a row. The only difference between their baby and your baby is…they’ve learned how to fall back to sleep on their own. That’s it. That really is the heart of the issue. Once your baby can fall asleep without help, they’ll start stringing together those sleep cycles. That’s going to make your baby a whole lot happier and, probably you too! So remember back at the start of that scenario, there you were, getting ready to put baby down for her nap, gently feeding and rocking her to sleep and then putting her down in her crib. Stop right there. That’s where you need to make some changes. Because in this scenario, you are acting as what we in the sleep consulting business refer to as a “sleep prop.” Sleep props are basically anything that your baby uses to make the transition from awake to asleep. Putting baby down awake to find sleep on their own is the key. have to be pretty, it just has to be functional. dog, siblings running around like banshees, or any other noise that might startle them out of their nap. Just make sure it’s not too close to their ears and not too loud. 50 dB is the recommended limit. 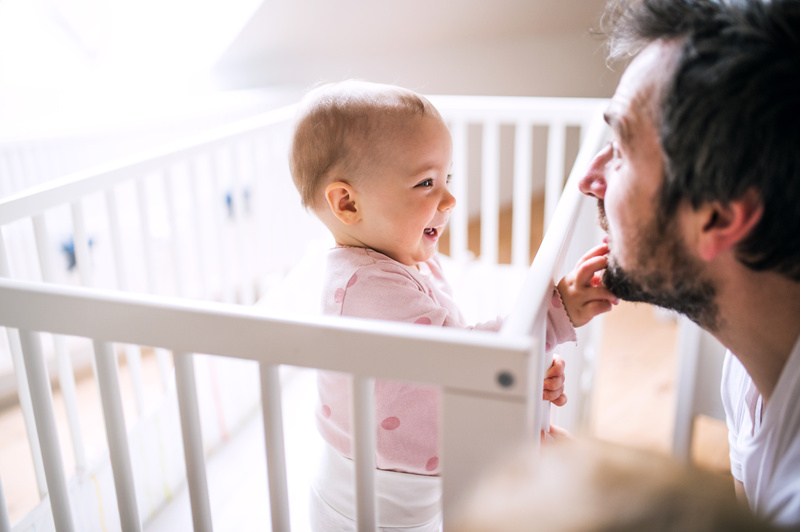 ● If you’re running into trouble putting your baby in their crib awake, that's where I can help. Sleep training is not an easy process for every baby and can be even more difficult for you as the parent. Shoot me an email so we can chat! YOUR BABY HAS LEARNED TO ROLL AND IT'S RUINING THEIR SLEEP! Has your baby started rolling?! This can be such an exciting milestone as a first-time parent but it can also be disruptive to sleep! Maybe your babe has made it onto their tummy and now they are stuck and are MAD! If this happens, you have to go in and roll them back over simple as that. The best thing you can do in this situation is to encourage lots of "rolling practice" during the daytime. Have tummy or floor time several times a day and allow your baby to practice those skills. The quicker they master rolling both ways, the sooner they will stop getting "stuck" while trying to sleep. Some parents get very anxious when their baby first starts making it onto their tummy and falls asleep that way. It has after all been drilled into our heads that babies have to be put down on their back to sleep. But that is the important distinction. Put your baby down for sleep on their back but if they can get to their tummy all by themselves, then you are okay to leave them there for sleep. There is no reason to flip them onto their back if they are comfortable and peacefully sleeping on their tummy. Most importantly, make sure you STOP swaddling by the time your baby starts rolling. It is a suffocation hazzard for baby's arms to be swaddled in when they start to roll. The American Academy of Pediatrics has now started recommeding that swaddling be stopped by 8 weeks old. To transition out, start swaddling with one arm out for a few days and then both arms out. Then you can go straight to a sleep sack.